Traditional Fiji Bure (cottages) on the outside! Pure luxury on the inside! Paradise Taveuni is Fiji's freshest new boutique resort nestled amongst lush tropical gardens with rainforest mountain as a back drop, catering to discerning travellers looking for their own piece of paradise . Its unique deep water frontage allows guests to dive, snorkel and swim from the lava flow edge into pristine warm tropical waters at any time of the day or night. Only a breezeway from the unique deep-water frontage, each traditionally thatched Fiji accommodation bure has spectacular views of either a stunning ocean vista or lush tropical South Pacific Island gardens. Situated on the southern tip of Taveuni, Paradise is a secluded getaway a mere one hour domestic flight from Nadi international airport followed by a scenic one hour drive from the Taveuni Matei airport. Activites include hiking, horseback riding, snorkelling, SCUBA diving, jet skiing, fishing, guided tours, cultural excursions, spa services and more. Ten brand new Fijian "Bures" are a recent addition to the resort . The new Fijian "Bures" combine traditional Fijian architecture with comtemporary design and standards. Experience intimacy and seclusion within a private garden with outdoor showers and jacquzzi in the oceanfront bures. Perfect for your Fiji Honeymoon! 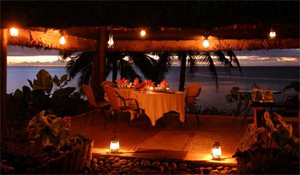 All who visit unique and secluded Paradise leave with a very real sense of Fiji in their hearts. Each bure has been hand built in 2006/07 with local coconut and rain tree woods. Glass doors open to a spacious deck completed with a Fiji daybed. 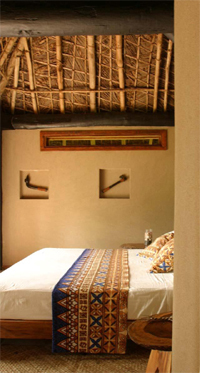 Inside the bure accommodation finds a generous king bed, spacious lounge room and modern bathroom. The essential Fiji out door shower within a private garden awaits all who enter and all oceanfront bures have a jacuzzi. The roof is thatched traditionally by the men of the nearby Vuna Village leaving the bures naturally cool as the traditional method of thatching ensures protection from rain, sun & heat. Surrounded by abundant tropical gardens, each recently built bure offers contemporary and luxurious fittings while demonstrating the architecture of Fiji throughout. 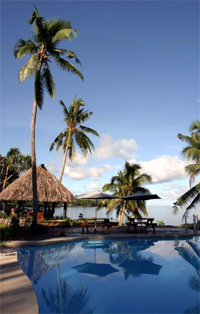 Paradise Taveuni has 10 new Fijian bures on the lush five acre property allowing privacy and seclusion for Guests. Five oceanfront bures have uninterrupted ocean views from the spacious rain tree deck. These bures also have a Jacuzzi in the private tropical garden. 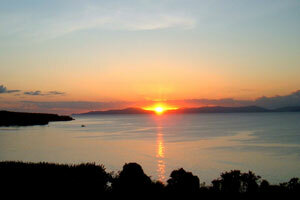 Five tropical bures have abundant garden and ocean views. 1 King bed in private bedroom, lounge room, modern bathroom with bath tub and shower, outdoor shower and Jacuzzi in private garden, sundeck & Fijian Day Bed. Ocean views 1 King bed in private bedroom, lounge room, modern bathroom with bath tub and shower, outdoor shower and Jacuzzi in private garden, sundeck & Fijian Day Bed. 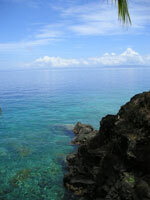 Located on the Taveuni coastal road to Vuna, (near Navaca) near the southern point of Taveuni. There is plenty to do at Paradise including diving, reef snorkelling, rainforest walks (or try Des Voeux Peak for a more challenging adventure), horse riding, village tours, jet skiing or simply relaxing.